Judging by the sheer number of papers reviewed in this Handbook, the empirical analysis of firms’ financing and investment decisions—empirical corporate finance—has become a dominant field in financial economics. The growing interest in everything “corporate” is fueled by a healthy combination of fundamental theoretical developments and recent widespread access to large transactional data bases. A less scientific—but nevertheless important—source of inspiration is a growing awareness of the important social implications of corporate behavior and governance. 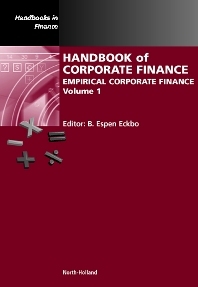 This Handbook takes stock of the main empirical findings to date across an unprecedented spectrum of corporate finance issues, ranging from econometric methodology, to raising capital and capital structure choice, and to managerial incentives and corporate investment behavior. The surveys are written by leading empirical researchers that remain active in their respective areas of interest. With few exceptions, the writing style makes the chapters accessible to industry practitioners. For doctoral students and seasoned academics, the surveys offer dense roadmaps into the empirical research landscape and provide suggestions for future work. Professor B. Espen Eckbo holds the Tuck Centennial Chair in Finance. He is also Faculty Director of Tuck's Lindenauer Center for Corporate Governance, which he founded in 1999. He teaches advanced MBA courses in the areas of corporate finance, corporate takeovers and international corporate governance. Professor Eckbo, who received a PhD in financial economics from the University of Rochester in 1981, has published extensively in the top finance journals in the areas of corporate finance, investment banking, and the market for corporate control. He is a recipient of an honorary doctoral degree from the Norwegian School of Economics, the prestigious Batterymarch Fellowship, as well as several outstanding-paper awards. He is a research Associate of the European Corporate Governance Institute (ECGI), and a frequent keynote and invited seminar speaker. He was called in 2009 by the U.S. Congress to testify on issues concerning the government’s large equity ownership positions in companies rescued under the Troubled Asset Relief Program (TARP).